Whatever Happened to Music Rivalries? The “pretty good” NBA veteran has taken a beating over the last half-decade. Owners crafted a new collective bargaining agreement that carries stricter controls on payrolls and player salaries. A harsh new luxury tax spooks everyone outside the heli-skiing set from even approaching the threshold. The natural losers, everyone assumed, would be the NBA’s “middle class” of veterans. Stars always get the max, young players earn what the rookie scale prescribes, and fringe players scrap for the minimum salary. The smartest teams would increase their odds of finding production on the cheap by hoarding their own draft picks, nabbing them from desperate teams, scooping up more second-round picks, and working nontraditional markets — the D-League and international free agency. This dovetailed with the rise of analytics and the influx of new owners from the finance world. These people are all about asset accumulation and maximizing return. Getting $5 million of production from a player earning $800,000 doesn’t just make financial sense. It’s freaking fun — a badge of honor, a sign you are smart enough to spot inefficiencies in the market filled with other smart guys. Veterans earning between $5 million and $10 million suddenly became the least desirable players in the sport. Study after study showed — accurately! — they represented the worst bang-for-the-buck among contract types. Minimum-salary players give you 80 percent of the production at 20 percent of the cost, the thinking goes, and they are generally younger. Hall of Famers bring championships, and any franchise serious about chasing the ring would judge each personnel decision by whether it got closer to its first or second Hall of Famer. Signing midlevel guys rarely passed that test. They’re not stars, and under the new CBA, they’re not trade assets that might get you stars. The phrase “just a guy” has picked up currency in NBA front offices over the last two years. I hear it all the time: “So-and-so veteran player is just a guy. Why would we pay him $6 million?” Front-office sources across the league say teams are gun-shy in pursuing such players via trade or free agency, in part because they fear media criticism. The ideal theoretical NBA roster consists of two or three stars earning the maximum salary, a productive young player on a rookie deal, minimum-level role players everywhere else, and perhaps as the last step, a mid-rung veteran or two willing to accept a discount. There is some truth in that. If you can get stars, you should get them. Duh. On the flip side, the Bulls continue to cycle minimum-salary players through their backup point guard spot, wring solid production from them, and then happily watch as another team overpays them in the summer. • Not every team can have two or three stars. Such players are rare by nature. Teams that don’t have them can’t just give up, even if the league’s draft system might encourage that route. • The new CBA didn’t kill the middle class. Plenty of guys sign in that dreaded $5 million–$10 million range every year: Corey Brewer, Kevin Martin, J.R. Smith, Taj Gibson, Gerald Henderson, Jarrett Jack, Chase Budinger, O.J. Mayo, Monta Ellis, J.J. Redick, Tony Allen, J.J. Hickson, and many, many others. It’s hard to meet the league’s payroll floor without those guys. Almost half the league’s teams enter free agency now with at least $10 million in cap room; they have to spend that cash on someone. The middle class has been squeezed a bit, but there is no evidence of any drastic change yet, according to several team sources and Ron Klempner, the executive director of the players’ union. • And most relevant right now: Playoff basketball exposes a player’s warts. The extra 20 percent of production a midlevel guy might bring compared to a minimum-salary player can be the difference between a guy who can be on the court in the postseason and a guy who can’t. The playoffs, even this first round of unprecedented unpredictability, are a different game. That’s true in a bigger-picture statistical sense: Teams play at a slower pace, and turn the ball over less. Fouls and free throws jump as teams amp up the physicality, pick on weak defenders, and make opponents earn every damn point. But in a broader sense, everyone is just more prepared. Teams throw all their scouting resources in the coaching staff and front office into charting the tendencies of one opponent.1 They kick around every way to attack an opponent, and coaches make adjustments they’d never make in the doldrums of the regular season. The Rockets filled out their wing positions by tossing minimum-level contracts at a collection of veterans — Omri Casspi, Francisco Garcia, Reggie Williams, Ronnie Brewer, and more flotsam — hoping one or two might emerge as rotation pieces. They dealt a minimum-salaried point guard (Aaron Brooks) to Denver for a wing player (Jordan Hamilton) on a deal just a hair pricier. And guess what. None of those dudes can get on the floor against Portland. A couple of them aren’t on the team anymore, and the ones who are have lost minutes to Troy Daniels, a sharpshooter who spent the season in the D-League. Hamilton’s disappearance has been a bit of a surprise, but he’s a bad defender, and coaches don’t trust bad defenders against deadly 3-point-shooting teams in the playoffs. Recent playoff history is littered with one-way players, or just slumping bench guys, who saw their roles reduced to zero or near-zero in the wrong series: Gerald Green, Matt Bonner, Tiago Splitter, Mike Miller, Shane Battier, Tyler Hansbrough, Bismack Biyombo, and many others. Opponents will target these awful defenders until you surrender and take them out. DeMar DeRozan isn’t a poor defender anymore, but he has no shot against Joe Johnson, and the Nets have posted up Johnson on almost every possession until the Drakes have shown some kind of adjustment. Had Minnesota made the playoffs, it may have run into an opponent that could have rendered Kevin Martin borderline unplayable. The Rockets didn’t really have the means to sign a “pretty good” veteran this summer. They cleared cap room for Dwight Howard, nabbed him, and then had no real money left — no midlevel exception. They could have that tool this summer, a crucial opportunity to increase their championship odds. Timing and context are crucial. It’s not as if Houston is uniformly opposed to signing guys in this salary range. 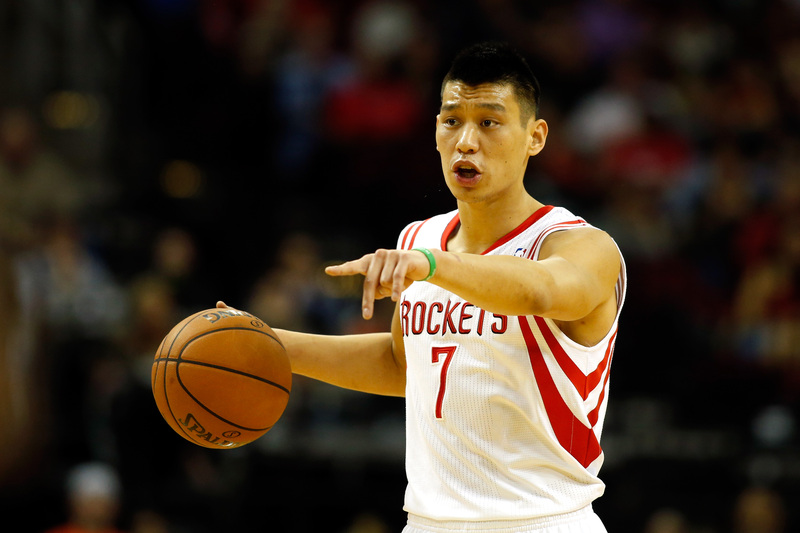 They have two: Omer Asik and Jeremy Lin. They view Asik as undervalued and a trade asset, though the league hasn’t agreed with them. Lin’s presence is instructive. Houston could have held on to Goran Dragic, a demonstrably better player, but it chose Lin in part because he accepted a three-year contract. Dragic insisted on a fourth year,2 and that was a deal-breaker for a Rockets team dreaming of stars, because that extra year made Dragic less of a trade asset. Lin has been bad on both ends against Portland, while Dragic blossomed in Phoenix. Houston is paying a price for prizing flexibility and star pursuit over all else. The Rockets didn’t believe they were quite ready to win a title this season, and they have a couple of bullets still left to use. But look at the Western Conference: The top two seeds are fighting for their lives, and the no. 3 team is grappling with what it means to play for a despicable human being. You never know when an opportunity might emerge. The Wizards were a rebuilding team when they dealt Rashard Lewis’s massive unguaranteed contract to New Orleans for Trevor Ariza and Emeka Okafor. Everyone laughed at them. The Hornets waived Lewis for cap savings, while the Wizards had voluntarily clogged up their cap with two mediocrities earning more than $20 million between them. Think of what else they might have done with that cap space, or all the juicy draft picks they might have piled up by staying horrible! The criticism was fair; the NBA is a shades-of-gray place. Taking on those contracts carried an opportunity cost. But it also brought the opportunity to field a team of, you know, good NBA players. 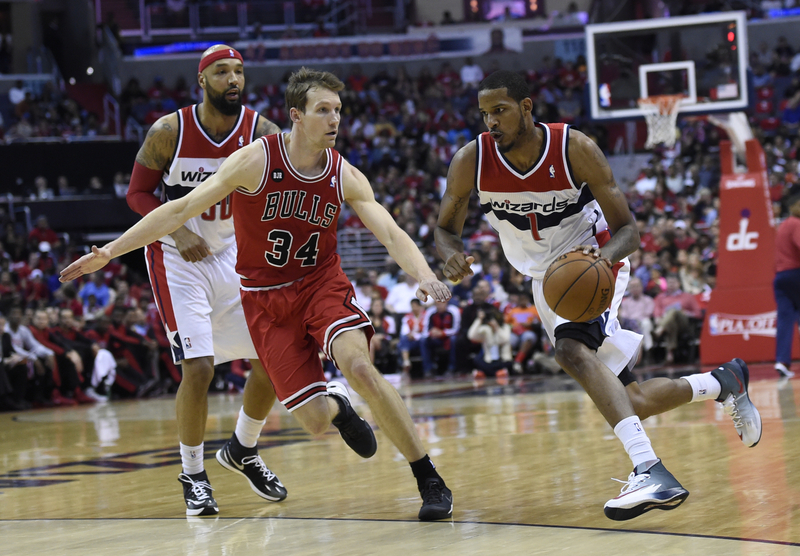 And holy crap, does Ariza look irreplaceable right now in shredding the Bulls. He has always been a very good defender, a long-armed pest with artful sliding footwork, capable of guarding either wing position. Washington has even used him to bottle up D.J. Augustin since the stretch run of Game 2. The Rockets had instant buyer’s remorse on Ariza’s five-year, $34 million contract, and swapped him for Courtney Lee in a four-team deal after the 2010 season. Ariza went to New Orleans, where he morphed into a horrifically bad shooter while experimenting with pull-up jumpers and off-the-bounce stuff outside his skill set. Seriously, his numbers were Antoine Walker–level bad. The Wiz bet he could do better, and Ariza has thrived as a spot-up mooch gobbling up open corner 3s courtesy of John Wall’s brilliance. He’s a useful secondary ball handler in very select matchups, and Washington in this series has allowed him to attack Mike Dunleavy Jr. The Wizards could not have known things would work out this well. They weren’t sure what Wall would be, and no one could have foreseen Ariza shooting like Ray Allen. And there was no fathomable reality in which Washington, in 2014, would be a threat to make the conference finals. But Derrick Rose is hurt again, the Celtics are gone, the Knicks were miserable, and the Pacers appear diseased. Basketball is unpredictable like that. Ariza is a free agent this summer, and teams will have to decide whether he can put up numbers like this without Wall. Again: Context is everything in the NBA. It’s not a coincidence that this list is full of wing players. Point guards and big men get paid. Hell, JaVale McGee somehow earned $10.75 million this season. The wing position is the league’s thinnest right now, and it’s also the place where teams try to cheap out and hope they can cobble together one useful player out of three substandard ones. It is a place for wagers on mercurial talent. The Wiz gave up more than a first-round pick in dealing for Gortat before the season. They gave up that pick in a market in which it carried astronomical value, and they attached Okafor’s giant expiring contract. Those had value together, and the Wiz could have combined them with other assets — Otto Porter,3 future picks, Wolf Blitzer — to chase a true franchise-level star down the line. And even with Gortat in a weak Eastern Conference, the Wiz still have championship odds somewhere very close to zero. Maybe this is all a fool’s errand, especially if the Wiz trap themselves into overpaying Gortat, who just turned 30, when he hits free agency this summer. But Gortat has been a nice two-way piece, setting nasty screens, finishing on rolls to the hoop with both hands, and providing solid interior defense. He and Nene have the Bulls’ defense on its heels. 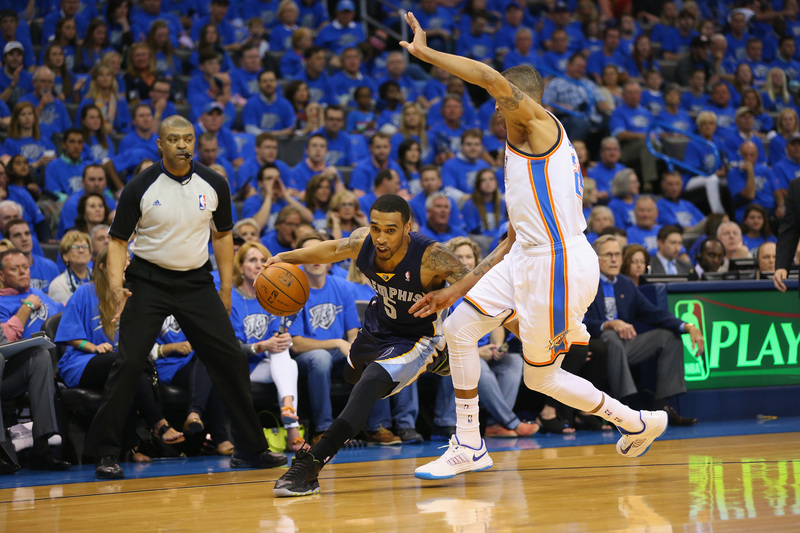 Everyone kind of shrugged when the Grizzlies dealt Jerryd Bayless for Courtney Lee in January. Lee was better and filled a need as a wing player who could both shoot and play decent defense. The basketball reasons were obvious, but analysts and front-office people4 were a little surprised the Grizzlies were willing to pay Lee more than $11 million combined over 2014-15 and 2015-16 — even if his former agent is now Memphis’s CEO. Was the lack of flexibility worth such a marginal upgrade? Flash forward to the playoffs, and Lee looks downright essential. Like, it’s hard to even imagine Memphis competing against the Thunder without him. Tayshaun Prince and Tony Allen can’t shoot, but the Grizz need one of them on the floor almost every minute to pester Kevin Durant. If you play one of those guys, your other wing better be able to shoot. Mike Miller can shoot, but he’s a defensive liability the Grizz must hide on a weak offensive player. Lee is the only guy who can play both ways, and he has logged 34 minutes per game. The Thunder must respect his 3-point shooting, and while Lee is probably just an average defender, average is fine, and he’s versatile enough to guard Russell Westbrook, most wing players, and even Durant on the occasional switch. Lee’s value is another reminder that timing these signings within a team’s broader trajectory is essential — and tricky. The Grizzlies are locked into three big-money contracts attached to players they like, and there was no palatable way to trade any of those three in an attempt to shift the direction of the franchise. Memphis’s front office believed it could be a dangerous playoff team, and understood it would have no means in the offseason to sign a player clearly better than Lee. This was a contender using a salary slot at an optimal time and swallowing the future cap implications. A rebuilding team would have had no interest in making such a financial commitment to Lee, unless it had drafted him and needed to re-sign him. I’m not sure any player has shuttled between “overpaid” and “underpaid” more often in popular conception since the Blazers swiped Wesley Matthews from Utah via the full midlevel exception. But here he is, humiliating a listless James Harden in the post, raining triples, and hounding Harden on the other end. Matthews can slide to bulkier small forwards if need be, helping to unlock Nic Batum’s flexibility on defense. Daryl Morey wishes he had a wing like this. 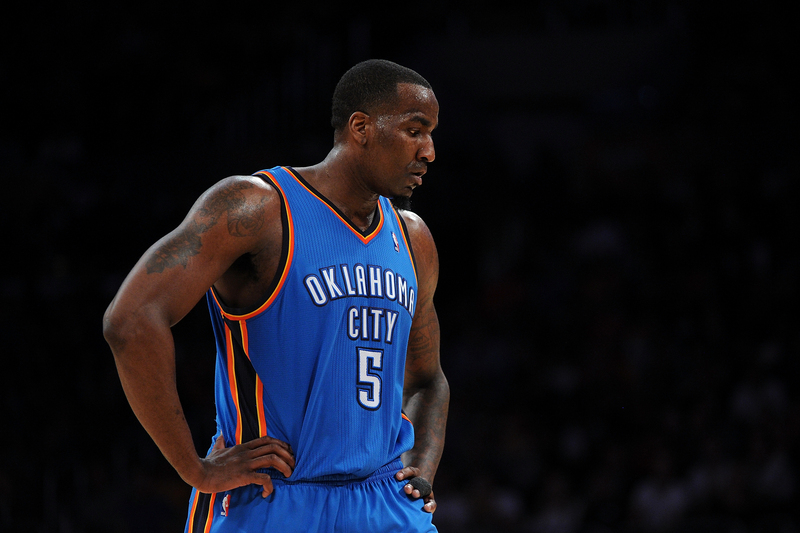 The Thunder were so close to the tax that they simply couldn’t use the full midlevel exception, and their big-money attempt at a “pretty good” acquisition — Kendrick Perkins — has mostly fallen flat. (Perk has done great work defending Zach Randolph in the playoffs, though.) Aside from Reggie Jackson, so wonderful in Game 4, their young players are either on the fringes of the rotation or out of it. Oklahoma City suddenly looks thin and top-heavy. That was Miami in 2011, when the Heat ran out of gas in the Finals. Their “pretty good” signings — Mike Miller, Udonis Haslem, Joel Anthony — gave them very little, and the Heat won championships only after reloading with Shane Battier, Ray Allen, and others. But those guys have faded this season, and the Heat lacked the resources to add additional proven dudes. Allen and Battier came at a discount, and that’s the dream: Get the “pretty good” guy below cost. The Thunder did that in 2010 with Nick Collison, signing him to a funky extension that paid him $13.3 million in 2010-11 precisely so they could keep him for around $3 million every year after that. These three teams already have Hall of Fame–level players, so perhaps they don’t really merit inclusion here. But that’s also kind of the point: When star-laden juggernauts face off in May and June, the guys one rung down can make the difference. The margins are that small. The Pacers are also in tax-avoidance mode, and they’ve failed to find “pretty good” production at discount rates for two years running. Gerald Green has thrived in Phoenix, but he was Indy’s free-agent signing in 2013, and he never fit in the Pacers’ slow-it-down, defense-first style. Green played in just nine of Indiana’s postseason games last season, mostly because Frank Vogel didn’t trust his defense. The Pacers flipped Green and Miles Plumlee (along with a first-round pick) to Phoenix for Luis Scola, trying to find some punch without adding any salary. Scola has largely disappointed. The Pacers opted against using the full midlevel exception in free agency, spending just a portion of it on Chris Copeland — an offense-only player who couldn’t get meaningful minutes until the Pacers fell behind by 30 last night. It would appear the Mavs sense a soft spot in the market: If everyone is running like hell from decent veterans, let’s stock up on them, and see if we can topple thinner teams that might have starrier names. Dallas’s depth has been an asset all season, and the Mavs had the league’s best offense after the All-Star break. We could list lots more of these guys playing outsize playoff roles while teammates with exploitable weaknesses, once rotation guys, fade to the bench: Amir Johnson, Kyle Korver, Redick, Henderson, and more. Contracts at this level make teams queasy, almost paranoid in some cases, and teams in certain situations correctly conclude that veterans in this salary range are not worth it. But the postseason is a fierce, cutthroat place. The extra 20 percent that doesn’t move the needle in the big picture can swing a series. Front-office folks are usually scouting two opponents at once — the present opponent, and a likely potential opponent in the following round. The fourth year is a player option, and Dragic has gotten so good he may well turn it down. Drafting Porter and signing Martell Webster via the midlevel exception complicates the picture here. Wing depth is nice, but using three valuable slots on Ariza, Porter, and Webster is not ideal. I was in the former group on this one. It’s unclear if either did, though I suspect some team might have given a tad more to Diaw. The Mavs and Harris initially agreed to a three-year, $9 million deal, but scuttled it when X-rays revealed Harris had a toe injury. He later signed a one-year minimum contract.